When is a circle not a circle? When it gets twisted into a spiral, that’s when. The Underground will never be the same. Is Harlesden going down the drain? Apparently not, as the area’s drains are all blocked. What is it with sexagenarians these days? Two pensioners with a penchant for purloining dosh that isn’t theirs have been asset-stripped and jailed. Bureaucracy beyond the grave: now one London council wants health and safety checks on memorials. What do Finsbury and the Gaza strip have in common? Similarly low life expectancy, that’s what. Two women have been arrested in connection with the Peckham murder of Dee Willis last week, whilst another man has been arrested in connection with the double New Cross murder. 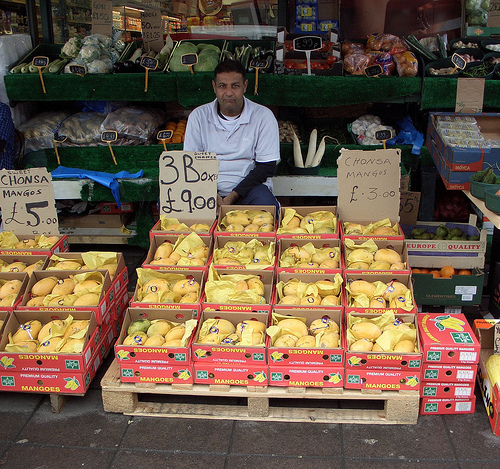 Mango man from jamesmorton’s flickr stream under the Creative Commons Licence. At least we can eat summer, even if we can’t see it.